A hot topic of conversation among inbound marketing strategists right now is #FlipTheFunnel, thanks to another amazing Atlanta based company, Terminus. This ideas has revolutionized business around the world in the way they reach and engage prospective clients. At Yip Yip, we see another idea that could be just as influential, if not more. Multiplying the funnel is where an organization recruits or empowers social employees, ambassadors, affiliates and/or influencers to consistently talk about the organization on social media. 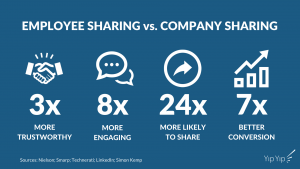 In fact, a Forbes article by Ryan Erskine, has added to the buzz by talking about about how using an employee advocacy program would increase your social engagement by 561%! We believe this is because a post created by an individual is more authentic and personal. It allows a prospective client to have a human to human interaction rather than the human to business interaction that occurs on our business’s social media channels. We here at Yip Yip have seen evidence of this in our own employee advocacy programs, or as we like to call it, Social Ambassadors. When we put a post out through our team we get more engagement than when we post to our Yip Yip pages. For example, an average Facebook page receives roughly 1-3% reach, compared to a personal profile post at 10%-25%. That means if you have 1,000 followers on your Facebook page, you’ll only have 100-300 views of your post. reach would increase from an average of 200 views to 2,957 views of your post! 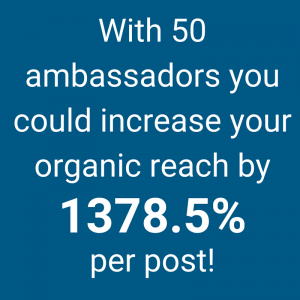 That’s a 1378.5% increase in your social media organic reach per post! With Inbound Marketing, the idea is that you use blog articles to capture people’s attention and then after they click they will have the ability to download something whether it be an infographic, ebook, free video, whatever it may be they have to fill out a form. From this form you send out a drip email campaign and hopefully turn that lead into a client. 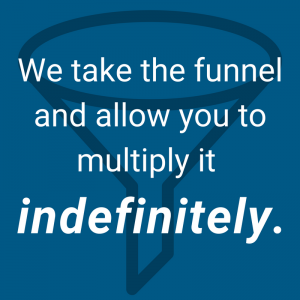 What we do is take differently is that funnel and give you the ability to multiply it indefinitely. Imagine that you already have a funnel created, say you’re the head of marketing or you lead a sales team. If you were to provide that funnel through the Yip Yip app, personalized for everyone on your team, knowing that individuals get 561% more engagement than businesses then imagine how many more leads you could be capturing. The best part is that you can do this all at the push of a button. This enables your team to increase their engagement on social media as well as spread your brand’s message. It keeps your people top-of-mind as well as credible and allows you and your team to have a wider reach, nurture one-on-one relationships and close deals. If you would like to learn more about how you and your team can increase engagement and capture more leads through a Social Ambassador program, click here.